In ancient times, people thought of the year in two seasons: the cold season, and the warm one. When the warm season arrived, there were great celebrations, full of hopes for the fertility of the land, on which everyone's lives depended. This is the origin of the holiday May Day. This year on the first of May I spent some time in the garden with a friend, digging up perennials to give away. Finding people to take the extras every spring is getting harder and harder, so I was delighted when she offered. Later I realized it was May Day, and thought, "Well, that's a good way to celebrate the occasion." But at the time, I hadn't been thinking about May Day and what it means. Sometimes the garden grabs my attention on a deep level, makes me realize what's important -- other times it's simply an activity I love. A few days later, however, May Day struck home. 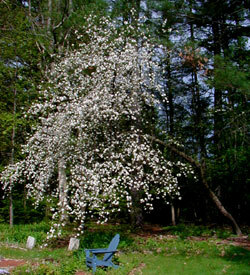 It started when my husband Ward took me out into the back yard to look at the old apple tree behind the garden: it was about to burst into bloom. This tree grows from the very edge of the woods, leaning out into the sun. It must have been planted around when the house was built, which makes it about a hundred years old. Over its lifetime the woods too moved toward the sun, with seedlings growing up in front of the apple, which then leaned out further to reach above them. Twenty years ago we cleared the forest back to the apple tree, so that now it leans out into open space, arching over the back of the garden. We needed to honor the tree's effort to reach the sun. Every year it drops dead limbs, and I worry about it... but it's still here. And now, coming into bloom, it had inspired Ward again. "Write about this tree," Ward said; "Write about the will to survive." The next day the flowers began to open; I took pictures. One tent caterpillar nest was on the tree; fortunately low enough that I could prune it off. Caring for this tree, commemorating its glory -- this felt more like a celebration of May Day. This tree is not just surviving, it is spending extravagant energy on blooming, on being fertile, on beauty to attract pollinators. This tree, old and infirm, overflows with the life force. I wanted to call this "The Green Fuse," but decided that was too literary for a newspaper column.